T-R PHOTO BY THORN COMPTON - Marshalltown freshman Phoebe Hermanson, right, races down the homestretch on the Marshalltown Community College course during the 45th Bobcat Cross Country Classic on Thursday. Hermanson led all area finishers by placing 34th. The 45th Bobcat Classic cross country invitational was one for the ages. 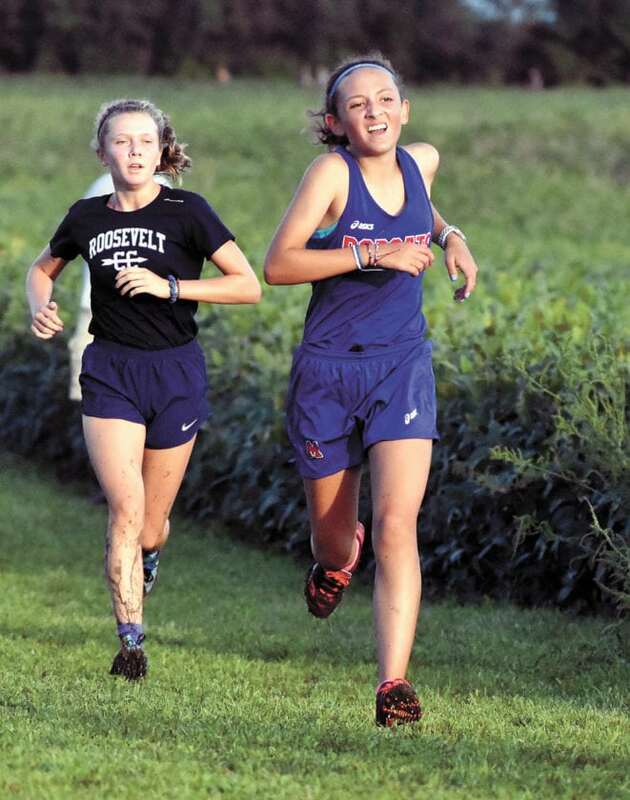 In total, more than 2,400 athletes competed at the Marshalltown Community College course on Thursday from middle school through the high school varsity races, and on the girls end each of the top 10 teams in Class 4A was in attendance. Amidst a field riddled with state-level competition, it was Bobcat freshman Phoebe Hermanson who shown brightest of the area girls. Hermanson placed 34th in the meet with a time of 20 minutes, 53 seconds, which was nearly a minute and 20 seconds faster from her time in the Earlybird Invitational two weeks ago. MHS head coach Stacy O’Hare said she was shocked at how well Hermanson competed, especially since O’Hare nearly didn’t put her in the varsity race. T-R PHOTO BY THORN COMPTON - East Marshall runners Wendy Liera, left, and Melinda Puumala, right, make their way through the course at Marshalltown Community College during the Bobcat Classic on Thursday. 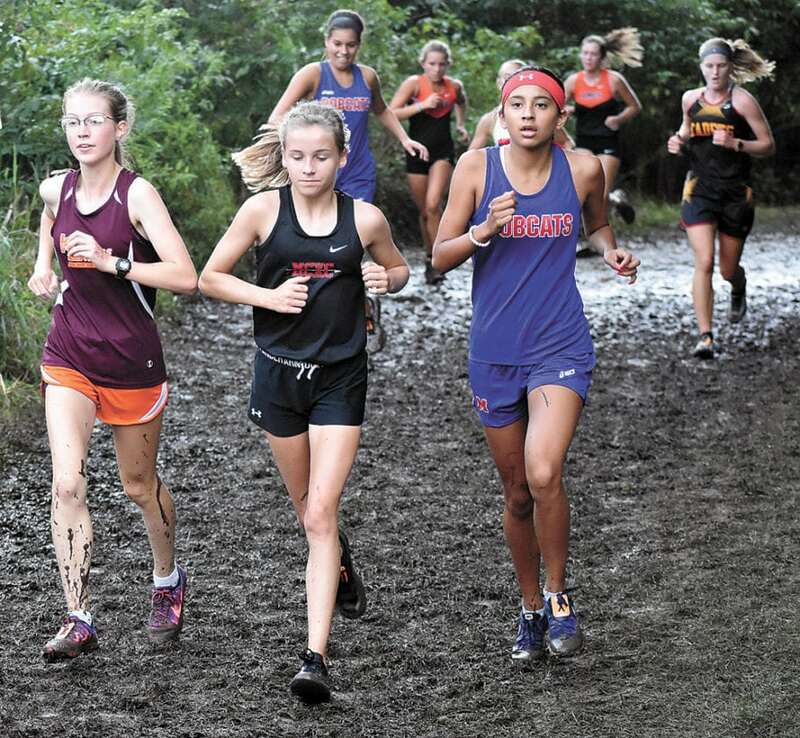 What made Hermanson’s time even more impressive was the conditions the course was in, as the rain from earlier this week turned the course into more of a mud pit than a running track. This was only Hermanson’s second varsity competition of her young high school career, and she has paced the Bobcats each time she’s ran. To have such a strong field to compete with in her second race was definitely an experience Hermanson said she can build on. “It was really cool to have everyone pushing you and all the good teams here because it just makes you faster and it’s nice to have a good challenge,” she said. Hermanson wasn’t the only Bobcat to improve on her last time at the MCC course, as Mia Barajas, Jade Tejada and Odaly Flores all saw time cuts in the Classic. As a team the Bobcats placed 18th with a score of 520. 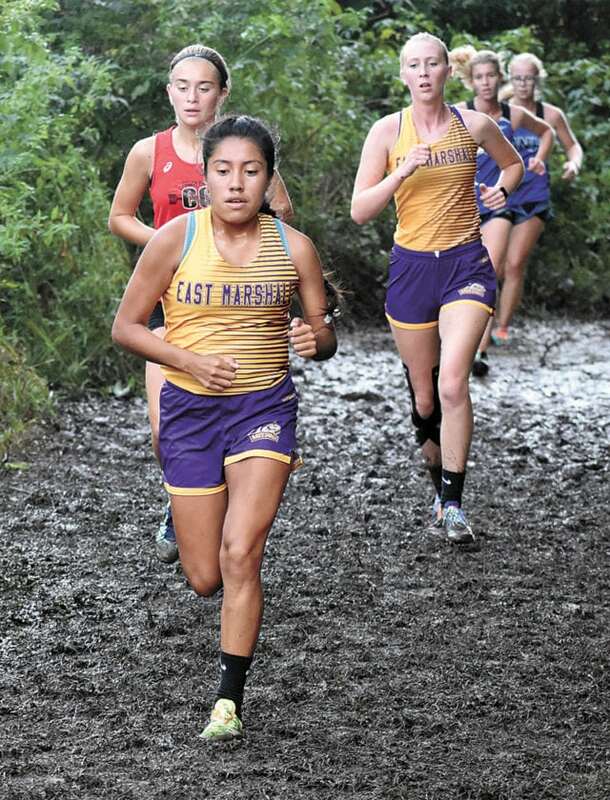 East Marshall followed just behind in 19th with a score of 576, with Wendy Liera leading the way by placing 90th with a time of 22:31. Melinda Puumala turned in a time of 23:35 for the Mustangs to come in 106th, and Maddie Duncan finished in 118th with a time of 24:12. East Marshall head coach Trent Taylor said the girls have come a long way as a team so far this season, and they have some potential if a couple other girls can show more improvement. “Instead of depending on one girl to be No. 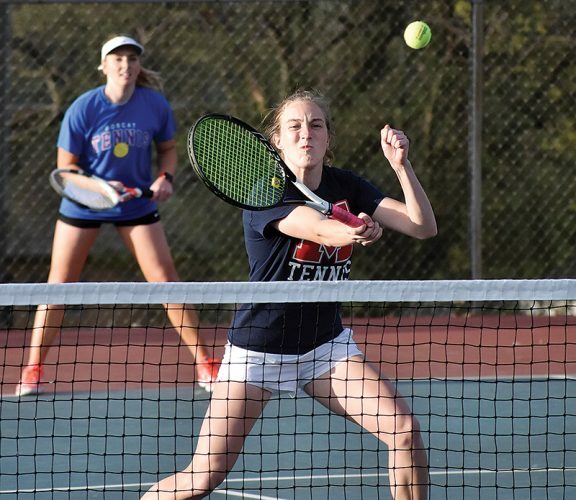 1 we have now two and three that were expected to run pretty competitively, so once we establish that four and five our girls can be pretty tough,” Taylor said. GMG was the next-best area team, coming in 21st with a score of 684. Angel Schewe placed 122nd for the Wolverines with a time of 24:25, while Zoe and Belle Duncan finished in 130th and 131st respectively. BCLUW took 22nd as a team with a score of 706. Katie Thompson was the top Comet runner with a time of 23:55, good enough for 112th. Madison Engle, Fiona Speicher and Payton Pekarek were all the next-best BCLUW girls, all finishing within five spots of each other. 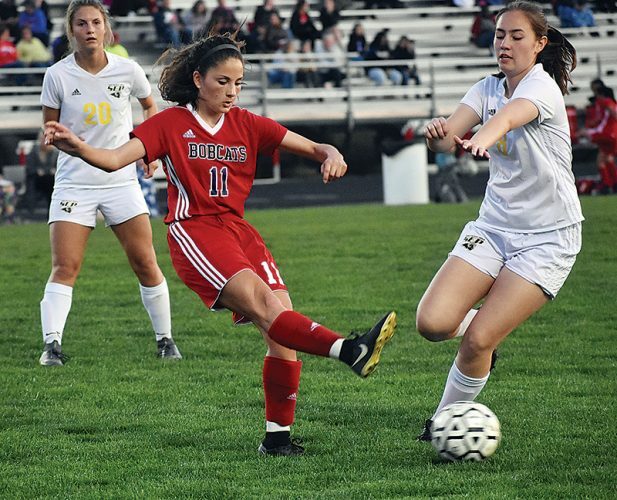 Comet head coach Donna Fiscus said given how early it is in the season she is thrilled with how well her girls competed in such a strong field. South Tama County didn’t have a full team to compete but senior Callie Frakes was the second-highest finisher from the area, taking 83rd with a time of 22:07, which was exact same time she ran at the Earlybird two weeks ago. Class 4A No. 1 Johnston was the top team finisher with 50 points, and Brooke McKee won individually with a time of 19:24 for the Dragons, nudging out 4A No. 2 Waukee’s Peyton Kelderman by one second to win the race. Team Standings — 1. Johnston 50, 2. Waukee 94, 3. Southeast Polk 100, 4. Dowling Catholic 144, 5. West Des Moines Valley 173, 6. Pleasant Valley 196, 7. Des Moines Roosevelt 198, 8. Ankeny Centennial 201, 9. Iowa City West 232, 10. Urbandale 246, 11. Dubuque Hempstead 290, 12. Cedar Falls 323, 13. Ames 369, 14. Iowa Falls-Alden/AGWSR 408, 15. Dike-New Hartford 410, 16. Ankeny 421, 17. Mason City 453, 18. Marshalltown 520, 19. East Marshall 576, 20. Waterloo East/West 612, 21. GMG 684, 22. BCLUW 706, 23. Fort Dodge 727. Individuals (top 10) — 1. Brooke McKee, JHN, 19:24; 2. Peyton Kelderman, WAU, 19:25; 3. Camille Jackson, Ames, 19:28; 4. Grace Larkins, SEP, 19:33; 5. Aubrie Fisher, IF-A/AGWSR, 19:33; 6. Sydney Schaffer, WAU, 19:48; 7. Taylor Kvale, DNH, 19:50; 8. Kate Timboe, DC, 19:59; 9. Kelsey Schweizer, DC, 20:00; 10. Aleah Tenpas, JHN, 20:01. MARSHALLTOWN (520) — 34. Phoebe Hermanson 20:53, 115. Mia Barajas 23:56, 120. Jade Tejada 24:13, 128. Odaly Flores 24:36, 129. Aida Amanza 24:55, 134. Kaci Uhde 25:01, 139. Mary Kate Gruening 25:25. EAST MARSHALL (576) — 91. Wendy Liera 22:31, 107. Melinda Puumala 23:35, 119. Maddie Duncan 24:12, 131. Mkenzie Robinson 25:00, 135. Olivia Terrones 25:06, 140. Addie Lane 25:40, 143. Hannah Roads 25:45. GMG (684) — 123. Angel Schewe 24:25, 132. Zoe Duncan 25:00, 133. Belle Duncan 25:01, 152. Emma Beeghly 29:17, 153. Grace Schewe 30:18, 157. Talia Trumbo 33:02. BCLUW (706) — 113. Katie Thompson 23:55, 146. Madison Engle 26:41, 149. Fiona Speicher 27:22, 151. Payton Pekarek 27:32, 156. Chloe Walters 32:58, 158. Paige Jacobson 34:25. SOUTH TAMA — 84. Callie Frakes 22:07, 123. Alyssa Chyma 24:32. T-R PHOTO BY THORN COMPTON – BCLUW senior Caleb Silver, right, and Marshalltown sophomore Javier Rodriguez, middle, lead a pack of racers down a muddy stretch during the 45th Bobcat Cross Country Classic on Thursday. T-R PHOTO BY THORN COMPTON – East Marshall’s Cade Curphy, right, and Cam Hungerford, left, hit the home stretch at the Marshalltown Community College course in the Bobcat Classic. T-R PHOTO BY THORN COMPTON – GMG junior Jackson Edens, middle, runs along with the pack during an early leg of the boys varsity race in the Bobcat Classic on Thursday in Marshalltown. T-R PHOTO BY THORN COMPTON – East Marshall runners Wendy Liera, left, and Melinda Puumala, right, make their way through the course at Marshalltown Community College during the Bobcat Classic on Thursday. T-R PHOTO BY THORN COMPTON – Marshalltown freshman Phoebe Hermanson, right, races down the homestretch on the Marshalltown Community College course during the 45th Bobcat Cross Country Classic on Thursday. Hermanson led all area finishers by placing 34th.